Physical media dead? Don't tell me that in a year that has seen more virtually lost movies rescued from oblivion and splendiferously restored for Blu-ray: a reconstructed original cut of It's a Mad Mad Mad Mad World, rescued and revitalized titles from the 3-D Film Archives (Dragonfly Squadron and The Bubble), restored versions of 55 Days at Peking, The Sicilian Clan, The Cabinet of Dr. Caligari, Mack Sennett shorts, and Betty Boop Cartoons immediately come to mind. Few Blu-rays, however, have been as hotly anticipated by this reviewer as David Strohmaier's restored Cinerama movies, released by Flicker Alley. In this era of insatiable instant gratification, it's worth remembering that these once hugely popular features were impossible to see at all, in any form, for nearly half a century. Filmed in the groundbreaking but technologically complex three-panel Cinerama format, these films were never shown on TV, and until now never released to any home video format. The number of three-panel cinemas dwindled rapidly after 1964; the state of the original film elements of these movies was unknown, and information about them at all largely inaccessible. That Cinerama nearly vanished forever from the world must have seemed unimaginable back in 1956, when Seven Wonders of the World opened. Cinerama was a bona fide pop culture phenomenon. The five original Cinerama films, all travelogues, grossed an estimated $90 million. That might not sound like much in today's world of billion-dollar-grossing blockbusters, but consider this: these movies were exhibited just 10 times per week, on a peak of 27 screens worldwide through 1958, with ticket prices averaging around $2.00. I did a lot of research about the process back in the late 1980s and early ‘90s, and in talking with people fondly recalling these long-lost movies, two stood out in their minds. One was Windjammer (1958), which broke away from Cinerama's usual globetrotting format, focusing instead on a single voyage the Norwegian sail training ship Christian Radich. The other was Seven Wonders of the World, which many regarded as the most visually spectacular, most polished of Cinerama travelogues. Seven Wonders of the World was the third Cinerama release, following This Is Cinerama (1952) and Cinerama Holiday (1955). The first film had been hosted by writer-broadcaster Lowell Thomas, one of Cinerama's original backers and, for the rest of his life, its most public advocate. Cinerama Holiday was primarily the work of Louis de Rochemont, who helped create The March of Time newsreels (Thomas narrated Fox's rival, MovieTone News), and later de Rochemont helped define film noir with his semi-documentary styled narrative features, beginning with The House on 92nd Street (1945). However, de Rochemont had a falling out with Stanley Warner, the theater chain that managed Cinerama's holdings, and plans for him to produce a follow-up to Cinerama Holiday fell through. Instead, and in order to meet contractual deadlines for new Cinerama product, Stanley Warner opted to expand upon raw footage shot by producer Merian C. Cooper and stunt pilot Paul Mantz for a proposed but abandoned second Cinerama release. Some 200,000 feet of film had been exposed on a globetrotting flight at a cost of about $500,000. The original plan was to build a narrative feature (i.e., story) around this footage, at one point for a picture to be directed by John Ford and starring John Wayne. Lowell Thomas was again brought back, and with Mantz more footage was shot throughout 1954 at a final cost of $2.8 million. The result is a real jumble of often disconnected material but, almost accidentally, it's also probably the most entertaining of the Cinerama travelogues, though Windjammer (actually filmed in de Rochemont's rival process, Cinemiracle) is perhaps the best overall. Like the first two Cinerama films, there's a standard, 1.37:1 prologue, this time in color, with Thomas, again in his "study," reminding the movie audience about the seven ancient wonders of the world, all but one lost to the ages. The simulated curtains than open to reveal in Cinerama that lone survivor, the Pyramids of Egypt. The movie is built around the idea of "wonder-hunting" for seven new, modern wonders, though the emphasis is clearly on natural, rather than man-made ones. Act 1 begins spectacularly with aerial shots of the Sphinx and Pyramids, then Thomas and Mantz fly eastward to Iguassu and Angel Falls, Brazil, Rio de Janeiro, Japan, Angkor Wat Temple in Cambodia, the Holy City of Benares in India, the Taj Mahal, the Church of the Holy Sepulchre in Jerusalem, and finally Mount Sinai. After the intermission, Act II flies over an East Africa volcano, visits with African wildlife and Watusi dancers, the Sahara Salt caravans, Victoria Falls, and Skyscraper City in Shibam (Saudi Arabia) before moving on to the Parthenon in Athens, the Leaning Tower of Pisa, St. Peter's in Rome and, finally, in America, mostly flyovers of the New York skyline, the Hoover Dam, churches of New England, the Grand Canyon, Niagara Falls, and the giant Sequoias of California. 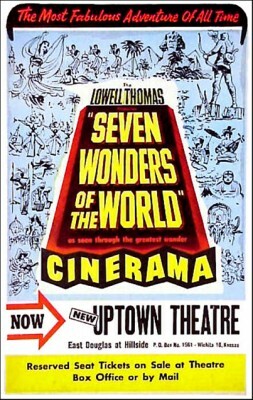 Seven Wonders of the World moves at a faster clip than either This Is Cinerama or Cinerama Holiday. The first film was essentially a demonstration of the process with no unifying theme, and most of the vignettes run a little long, even for those viewing the process in true Cinerama under optimal conditions. Cinerama Holiday had its sluggish spots, too, but its premise of following two vacationing couples brought a decidedly human angle to the process, an element missing from both This Is Cinerama and Seven Wonders. Seven Wonders moves much faster, but its lack of human characters to interact with all that spectacular scenery also damages it slightly. Unlike This Is Cinerama, Thomas appears on camera in some scenes but often not, probably owing to all the footage shot by Cooper and Mantz before Thomas became actively involved in the project. Lowell Thomas was the Walter Cronkite of his day, but by today's standards his narration is often spectacularly corny (eyeing a camel he asks, "How about a piece of gum, chum?") and even cruel (the Cinerama cameras capture a hunt to pry baby elephants from their mothers so that they can be trained for physical labor: "How do you like going to ‘school?'" asks Thomas, cynically). Seven Wonders of the World likewise abounds in very ‘50s concepts about "progress," capitalism, and democracy vs. communism, the popular technological marvel seen as a great communicator of "Free World" ideology. One of the most creepily, unintentionally prescient shots, quite beautifully composed, actually, has a group of Arab Muslims praying to Allah with a colossal American oil refinery billowing smoke in the background. Though repetitive, the aerial footage is fabulous throughout, and it's particularly fascinating to see famous sites before developers, freeways, and Starbucks Coffee shops overran them. Scenes from Japan's Takarazuka stage show is like experiencing postwar Japan through a time machine, though exterior footage insists upon putting everyone, especially all of the many children on camera, in traditional, colorful kimono, hardly daily wear even then. In India there's an extended but silly "audience-participation" vignette featuring a supposedly runaway narrow-gauge train, but it delighted my seven-year-old. A lengthy Act II sequence follows a family scrambling to attend Mass at St. Peter's presided by Pope Pius XII. Though it runs a bit long, back in 1956, when overseas travel was prohibitively expensive, Catholic viewers must have been overwhelmed by this virtual audience with His Holiness. Seven Wonders of the World's transfer is a bit of a wonder itself, especially taking into account the condition of the original elements. The image is exceedingly sharp with startlingly rich color. The Smilebox formatting approximates what 1956 audiences saw and suggests the audience participation effects that wowed movie-goers then and which are still pretty impressive as presented here, even though on the biggest home theater screens it's still not really Cinerama, just an incredible simulation. Strohmaier's restoration (in which all parties involved are generously credited and highlighted) expertly minimizes the join lines between the three panels, matching the color while eliminating unsteady panels, blemishes and other issues. The full roadshow version is here, with the original film's overture, intermission break, entr'acte and exit music intact. The 5.1 STS-HD Master, adapted from the original 7-channel magnetic sound mix is extremely impressive as well. (A Dolby Digital 2.0 mix is also offered.) The disc is region-free, and DVD versions of the film and its extras are included, though you'll not want to watch them that way. The supplements are, as usual, terrific, headlined by "Best in the Biz," a new documentary about the composers of the Cinerama travelogues' scores, hosted by authority Jon Burlingame. "Cinerama Everywhere" is a neat featurette about a roving Cinerama "tent" exhibit and features film of multi-screen pioneer Abel Gance Napoleon. Strohmaier is on hand to offer a brief but extremely interesting overview of the restoration process. Also included is a good Publicity and Behind-the-Scenes slideshow, a full-color booklet replicating the original program book, a breakdown reel, newsreel footage, and trailer, including one for a wisely aborted CinemaScope conversion release. Seven Wonders of the World is yet another must-see Blu-ray, best experienced on big screens and high-def projectors. The Best of Cinerama, Cinerama's Russian Adventure, and The Golden Head are, reportedly, on the horizon from Strohmaier and Flicker Allety. (So where's The Wonderful World of the Brothers Grimm, Warner Bros.?) It's one of the best Blu-ray releases of the year and a DVD Talk Collector Series title. Stuart Galbraith IV is the Kyoto-based film historian and publisher-editor of World Cinema Paradise. His credits include film history books, DVD and Blu-ray audio commentaries and special features.